Unlike plastic models, a wood kit will take color nicely from a stain. A gray stain works well for simulating older untreated wood. ©2012 Ryan C Kunkle, licensed to About.com, Inc.
For modelers accustomed to plastic model kits, a wood structure can be intimidating. In fact, while there are some differences the same essential modeling skills and techniques apply. Actually, using natural materials such as wood makes it even easier to create realistic finishes and weathering. As with learning any new technique, it is always a good idea to start on a simple project. This kit, marketed as a Newspaper Office, from Durango Press (now part of JL Innovative Designs) is one such model. Although they call it a newspaper office, the nondescript building could be used for almost sort of small business, office or storefront. After much debate, the search for interesting interior details ultimately led to this kit's theme of a small town sherriff's office for the Rio Grande Project Layout. The kit features wood walls and trim to build the main building and a second small structure that can be a stand-alone shed or an addition. Doors and windows are plastic, cast metal parts are used for the cornice, chimney pipes and other details. Cardstock is supplied for the roof. Before starting any kit, it is a good idea to familiarize yourself with all the parts and assembly process. The instructions included with the kit are a good reference. Check the wood parts for any rough edges and sand if necessary. The first step in the assembly process is to stain the wood parts. You can use traditional wood stains and techniques. I found a nice gray stain from Minwax which worked perfectly to simulate aged and untreated wood. The stain also helps seal the wood to prevent warping if you paint it. To build up the color with a stain, apply multiple light coats, lightly buffing with an old cloth in between. If you are going to paint interior walls, stain the inside as well. After staining, walls can also be painted as with any other kit. I painted the front wall of this building using Polly Scale Aged Concrete. Trim, doors and windows on the front were painted Wisconsin Central Maroon. The other walls were left in their aged wood stain with white windows. When walls developed a warp, clamps and the foundation beam pulled them back into shape. ©2012 Ryan C Kunkle, licensed to About.com, Inc. Despite staining both sides of the wood (perhaps not deeply enough), the long walls of the kit warped when the interior side of the walls was painted. Fortunately, warps like this are easy to correct. The kit includes 10x12 stock for the foundation of the walls. Cut the strips to length and apply glue to the underside of the wall. Wood glue works well and dries quickly and firmly. To remove the warp, clamp the pieces together with small bar clamps placed close together. These little clamps can be found in hobby catalogs and also frequently show up in discount tool bins in hardware stores. You can never have too many in your toolbox! Leave the clamps in place until the glue has completely set. For different kits, you could also add an extra brace on the interior using bass wood strips. A magnetic jig is a tremendous help when gluing walls together. ©2012 Ryan C Kunkle, licensed to About.com, Inc.
Wood kits assemble easily with wood glue. 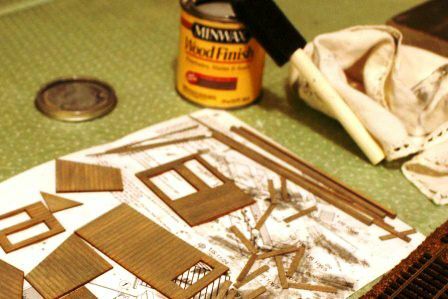 Unlike other plastic kits or laser-cut kits with tabs in the walls for a matched joint, this particular wood kit leaves making the corners square up to the modeler. To keep the corners square, line everything up using a builders square, apply wood glue, and hold everything in place using magnets. A magnetic jig like the one seen here is another simple but valuable tool. When gluing parts, apply glue sparingly. Wipe off any excess glue with a damp cloth before it dries. It may be necessary to reapply a little stain to touch up spots around the corners. This is easy to do. The Sherriff's Office interior features a relaxed sherriff and an alerted dog who hears something happening in the back... The little story will be completed once the building is installed on the layout. ©2012 Ryan C Kunkle, licensed to About.com, Inc.
Like all kits, this project offers opportunities to expand upon the original materials. The first addition to this model will be an interior. As this will be a foreground structure with large windows in the front, a little extra effort here will really pay off. In general, interior scenes do not need to be as detailed as the exterior as they can only be viewed from limited angles and lighting. Still, some signs of life inside go a long way in completing any structure. This kit did not include any provisions for an interior, but it is not difficult to add one. The floor was made from a piece of balsa wood cut to fit and attaches directly to the foundation beams. The color of the wood looked close enough to a pine floor that it was left unpainted. An interior wall was made from a piece of scribed wood siding. This same material will also be used to upgrade the roof. Scribed styrene could also be used, but the wood provided an easier option without the need for any extra painting or treatments. The wall was measured for length and the profile of the peaked roof was matched from the rear wall of the kit. After dry-fitting, the walls were trimmed until the roof was a perfect fit. Then the wall was glued in place with wood glue. This will divide the finished and unfinished portions of the interior and provide a support for the light. Since this kit could have developed into any number of businesses, a trip to the hobby shop determined its identity. Searching the figures and details, a Preiser figure caught my attention. It is a police officer with his feet propped up on the desk reading the newspaper. The relaxed attitude seemed perfect for a small town. With a little paint, this figure could have been turned into any person, but I eventually settled on leaving him in uniform. The desk was modified with the removal of the modern desk lamp and the addition of some paper piles and a painted blotter. The rest of the office furnishings came from a Model Power set. Wall hangings and the door to the back rooms (not modeled) were made on cardstock. A dog, also a Preiser figure, stands alert and barking at the door in a futile attempt to alert the officer to strange noises from the rear. That scene will compliment the finished structure where a figure will be seen escaping from a hole under the foundation. Little scenes like that, no matter how improbable, can add a whole new dimension to a layout. Lighting for the interior is a single 14 volt grain-of-wheat bulb. The bulb is positioned near the peak of the roof and attached through a hole in the interior wall. This allows the light to fully illuminate the scene without being seen. The wires continue through another hole in the floor to a wiring bus below the scenery. There is no lighting in the back rooms of the building. Details would be less visible through these windows and having some light and dark spaces in any building increases authenticity. Each of the windows was weathered. Iron security bars were added to one with 22 gauge wire. ©2012 Ryan C Kunkle, licensed to About.com, Inc. The plastic windows and doors included with the kit are like any other plastic kit. It is easiest to paint the parts while they are still attached to the sprues. Even though most of the windows were molded in white, the side and rear windows were still painted white to eliminate the plastic look and make the weathering powders stick better. After painting, the windows were dusted with gray weathering chalks. Then they were sprayed with a clear flat finish to seal the chalks. This left a nice weathered wood look which matches the bare-wood look of these walls. After the windows were dry, glass was cut from the clear acetate plastic included with the kit and inserted in each pane. Use a clear parts cement to secure the glass. A cracked pane was made by scratching the plastic with a hobby knife. The windows and doors all fit a little loosely in the pre-cut wall openings. Attach the parts using cyanoacrylate (CA) and make sure they are level. For added detail, one window was fitted with iron security bars. The bars are nothing more than 22 gauge wire stripped of insulation, straighted and painted grimy black. They are attached to the window frame with CA. The kit's roof was replaced with one of wood. The scribed siding on the back of the front wall must be trimmed to match. ©2012 Ryan C Kunkle, licensed to About.com, Inc. The kit includes three pieces of cardstock along with instructions for adding tissue paper to make a tar paper roof. The method would work, but to match the weathered look of this building, the same methods used on the boarding house were used again, but with a greater degree of weathering. The cardstock is replaced with scribed bass wood from Midwest Products - the same material used on the interior walls. The sheet was cut to make two panels for the roof and stained. Extra bracing was added to the back wall to help support but also position the roof. The siding on the rear of the front wall needed to be trimmed to the proper angle to match the roof. This was easy enough to do by using the new panels as a guide, marking the wall, and trimming them in place with a sharp hobby knife. Small changes like this are to be expected when working with wood kits. Prior to gluing both pieces in place, paint the inside flat black near the light to help prevent a "glowing roof" later. The roof is completed with "tarpaper" taken from another Walthers kit, which will have its roof replaced with shingles. Simple "kitbashes" like this help make models stand out from your neighbor's. If you don't have another kit, you could make your own by cutting black construction paper into strips, or by the paint and tissue method listed in the kit instructions. To add to the effect and show off the wood roof underneath, several pieces of the paper were lifted and torn. Patches were painted on and pieced together in other parts of the roof. It looks like its about time to put some money into the local sheriff's office! Signs, advertisements and weathering add a touch of color, history and realism to the building. ©2012 Ryan C Kunkle, licensed to About.com, Inc. The final step is to complete the exterior of the building with signs and weathering. The lettering for the office was made letter-by-letter on the front wall with decals. Applying decals to a painted wood model is much like any other. Once in place, simply wet the decals with a little setting solution to allow them to settle into the gaps between boards. The most challenging part of the decaling is laying out the letters themselves. Center the wording on the wall from end-to-end. Use the scribed siding to keep the letters straight and try to keep the letters spaced out evenly. It helps to lay the decals out on the wall with the backing still attached and lightly mark the center and ends. Then when you put them in place, you'll have a reference. Advertising signs add a lot of color to the gray side walls. On the side most easily viewed, several were laid over top of each other to add a little history and color. Most of the signs came from JL Innovative Designs, and a few were salvaged from the scrap box. Although these signs are paper and already have a nice look, they can be further aged and made to fit the contours of the walls in the same manner as aging decals. In addition, the edges of some of the signs were frayed a little with a sharp hobby knife to add more effect. Apply the signs with a little white glue, using a fingernail to press them around all the ridges. After the stove pipe (included with the kit) was added, all that remained was to blend everything together with a little weathering. Weathering chalks were lightly brushed onto the walls and roof. A medium gray toned down the roof and walls. A medium earth color was brushed up from the base representing dirt kicked up by falling rain and dust. A little rust and black soot around the stove pipe and the building is ready. Once the building is in place, additional details like weeds, junk, and an escaping convict around the foundation will complete the scene. The wood sidewalk included with the kit was assembled per the instructions and will be placed once the building is set. The completed corrugated roof looks so real you'll want a tetnis shot before you touch it. ©2012 Ryan C Kunkle, licensed to About.com, Inc. This kit also includes parts for a small shed. The shed was assembled in the same manner as the larger building with the exception that it didn't get an interior or lighting. To add more character, this little outbuilding also received an old corrugated metal roof. We spend a lot of time looking at the top of our models, so a detailed roof is a sound investment in modeling time. Fortunately this roof doesn't take a lot of time, or money, to create. Once the shed is placed on the layout, piles of junk, scrapwood and weeds will complete the look.